Charles Eugene Ash, Jr. age 78, of 28700 Norris Road, Tippecanoe, Ohio died in Community Hospice Truman House at 4:26 p.m. Monday, May 14, 2018 surrounded by his family. He was born October 6, 1939 in Harrison County, Ohio. He was a son of the late Charles Eugene Ash, Sr. and Edith Fern Miller Ash. He worked for Stillwater Clay, Massillon Steel Casting, and retired in July 2016 from Washington Township. Junior was a 60 year plus member of the Washington Township Volunteer Fire Department in Tippecanoe. His wife of 58 years, Golda Rose Wicker Ash survives. They were married January 9, 1960. Also surviving are a daughter: Linda F. Chandler (Tracy) Holdren of Cambridge, a son Paul Leslie Ash of Tippecanoe; five grandchildren: Shannon (Howard) Wetzler of Cambridge, Heather Chandler of Dillonvale, Jessica Cox of Uhrichsville, Megan (Cody) Smith of Gnadenhutten, and Landon Ash of Tippecanoe; eight great-grandchildren: Nolan, Aubree, Mackenzie, Cole, Allison, Emma, Hattie, and Dontay; and a sister, Grace Bellar of Dover. In addition to his parents, he was preceded in death by a son, Ray Edward Ash on January 29, 2006, a son-in-law, Jeff Chandler on March 31, 2006, a brother, William Shepherd and a sister, Betty McConnell. Visitation will be held from 2 to 4 p.m. Thursday, May 17, 2018 in Koch Funeral Home, 216 S. High Street, Freeport with the funeral service beginning at 4:00 p.m. Pastor David Koch will officiating. A fireman service will follow immediately after the funeral service. Burial will follow in Greenmont Union Cemetery, Freeport. A time of fellowship and food will follow at the Tippecanoe firehouse. 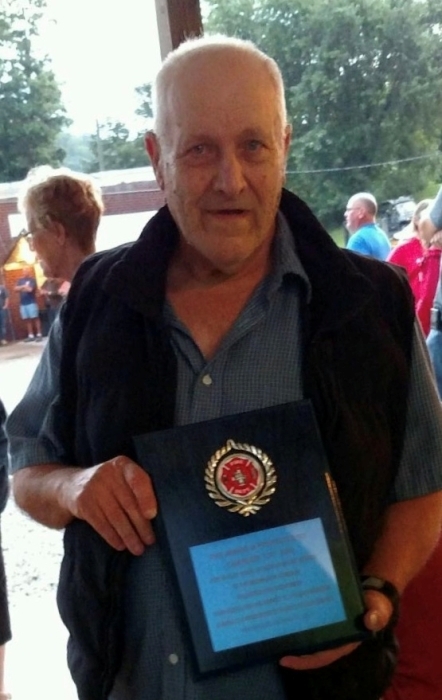 In lieu of flowers, memorial contributions may be made in his memory to the Washington Township Volunteer Fire Department.